Luck. From lucky rabbit’s foot to a horseshoe nailed over the door, symbols of good fortune come in all shapes and sizes and can be anything really. Some are deeply rooted in culture and represent generic or personal beliefs. Some are there just for fun. For the next few days, I’ll be delving into these interesting and curious symbols of good luck. What does today’s title mean anyway? Shakespeare coined this bit from Hamlet: Slings & Arrows of Outrageous Fortune. Essentially it means good luck or bad luck, you can’t prevent luck from happening so go with the flow. I prefer good luck. The origin of the word Luck pops up in old Dutch sometime in the middle of the 1400’s. Back then it was known as luc, gelück, or gelücke. Etymologists believe luck is a gambling term. The interesting thing about luck, to me anyway, is it’s considered a force. Think about that. Forces are the forte of Sir Isaac Newton. They’re gravity and magnetism. Forces are things out of our control. They are the slings and arrows of outrageous fortune. They influence good and bad and there’s nothing we can do about it. Except carry a talisman in our pocket and hope for the best! So how did luck symbols even come into being? Say it’s 10,000 years ago. You’re out foraging and find yourself in a downpour. You decide to take cover under a tree, but a glittering stone on the ground draws your attention and you stop to pick it up. Suddenly, a lightning bolt strikes and explodes the tree right before your eyes. That’s one lucky stone in your hand! From here on out, those glittering stones protect against lighting. And everyone wants one. I once read a story about a man in Africa whose son lay dying. Feeling hopeless, the father went walking one day and came across a stream filled with water-smoothed pebbles. He stood at the water’s edge and prayed for anything that would help his son. One nondescript pebble caught his eye and he picked it up and brought it home. I don’t know what the son’s illness was, but after receiving the stone, he got better. The man’s neighbors couldn’t believe it and they asked about this miraculous recovery. The man attributed his son’s return to health to the stone he had found. Some people asked him to find them stones for loved ones who were ill. He did, and those people got better. It made the local news, then the regional news. And it eventually made international news (and that’s how I found the story). But get this, people from all over the world send money to this man to go find a pebble just for them. He has a regular cottage industry now — Pebble luck charms. Lucky stones indeed. The idea that forces are attributed to stones is ancient. I can’t recall the smaller details, but an odd glass-like yellow stone sat in some pharaoh’s headpiece and was considered extraordinarily rare and powerful. The Stone of Scone a.k.a. the Stone of Destiny is the rock upon which the kings of Scotland were crowned. The Black Stone of the Kaaba is a stone set into a tower and devout Muslims circle it in the Hajj pilgrimage. It’s was revered long before Mohamed became a prophet and is considered by some to be a meteorite . Everyone knows about the Blarney Stone in Cork, Ireland. This awkwardly located (and no doubt germy) stone is set in the battlement of Blarney Castle and kissing it gives you the gift of persuasive speech. In Jerusalem, the Foundation Stone and the site it sits upon under the Dome of the Rock influence three major world religions. Doing research for my magnum opus (my heavy work in progress), I discovered legends that say that huge stone hovers over the Well of Souls and doesn’t touch the ground. All these stones somehow became symbols of force. They guided (and still guide) a lot of people. On a smaller scale, precious or semi-precious stones have long been considered symbols of wealth and power. Crowns and sword hilts alike were studded with them. Eggs and other trinkets encrusted with them. And peoples around the world conquered for them. The more rare, the more coveted. Giving rare stones was long considered a token of high esteem. A rare gem for a unique person is a symbol of the unique sentiment that person arouses in the giver. Example: It’s thought that when Archduke Maximilian of Austria gave a love token of a diamond-studded ring to Mary of Burgundy, he started the “diamonds are forever” symbology that connect diamonds to one’s fiancé today. Do you know what your birthstone is? Some of the following are more rare than others. The list has me wondering if it goes back to the days of alchemy. I’m curious now so one of these days I’ll do more research. Mine is the diamond. It’s supposed to be a stone that brings me luck and good fortune. The person of conscience I am wonders about those child slaves toiling in the world’s diamond mines so someone’s fiancé can have a rock on her finger. I don’t think that sad fact makes for a lucky stone. In the same vein, the rabbit foot may be lucky to the person who owns one, but I’m certain the rabbit had his own opinion on that. Who hasn’t heard of luck charms? Mention a rabbit’s foot or a horseshoe nailed over the door and our minds make an immediate association to luck. Symbols of good fortune represent generic or personal beliefs and come in all shapes and sizes. From simple to wacky, I’ll be delving into these interesting and curious talismans over the next few days. Why do people like luck charms? I suspect because our existence is filled with curve balls. Who wouldn’t want to believe good forces are working on our side? I enjoy them for the symbols they are. My mother went to Italy when I was a teen, and I asked her to bring back a cornicello for me. The cornicello is a popular luck talisman in southern Italy. My grandfather came from Sicily so I figured the charm was a nice nod to the old country. I still have it. Thousands of years before the onset of Christianity, the horn was associated with the Goddess in all her aspects. It was worn on her behalf with the hope she’d shine a little good fortune on the wearer. My little horn-shaped luck charm is made of red coral but they also come in bone, silver, and gold. The cornicello, also known as a cornuto or corno, has ties to the Celts who weren’t just located in the British Isles. They were all over Europe as well as parts of Asia and Africa. As teen, I used to wear mine on a silver chain strung alongside my mano cornuto — another Italian charm. Those curious little charms come in a range of styles. Mine is basically a small silver fist with the first and pinky fingers extended. In Italy they’re also known as a malocchio or mal occhio (from the Latin for bad eye. In other words evil eye) The evil eye equals every negative or malicious thought anyone can glare your way from envy to death wishes. Upright, this little hand is supposed to look like a devil’s head with horns sticking up. Now before you peg me as an Illuminati or witch or some such thing, I’m not. The little hand is worn upside down and therefore works as an apotropaic luck charm (from the Greek apotropaios meaning averting evil.) Symbolically, upside-down is interpreted as the opposite of something. The maloccio comes from today’s Italy, but it was known as oculus malus among the Ancient Romans. The evil eye belief is found all over the world. In Scotland it’s known as the droch shuil. In France it’s the mauvais oeil. 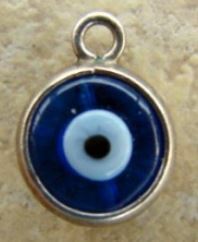 In Germany, the evil eye is called the bösen Blick. And it’s known as ayin harsha in Arabic, and ayin horeh in Hebrew. If you’ve ever seen blue bulls eyes made of glass on pendants, beads, rings, etc, you’re looking at an apotropaic luck charm. Each Christmas I give an apotropaic luck charm to my friends. It comes on a card explaining its history and where it comes from in the world as well as what it symbolizes. I call them wishes — an intentional wish for my friends to have good health, prosperity, vitality, happiness… You get the picture. I’ve mentioned before that I was once involved with living history. Our odd hobby began in 1984 and we raised our family in it. At one point, from April to October and just about every weekend we participated in living history events across five states. Oh to have that stamina again! 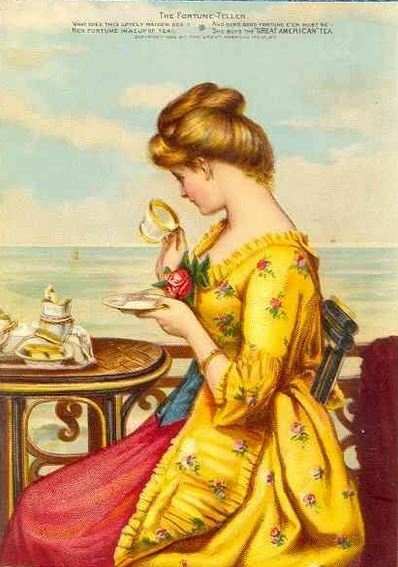 One of my fondest memories was tea time. I’d set out my linen and china, my silver spoons and silver service, then invite my colonial lady friends and the occasional colonial gentleman to our camp. I’d brew tea to go with fire-baked shortbread, cobbler, and dried fruits. Our accouterments were the genuine article. You have to have antiques or fine reproductions to portray living history with any degree of authenticity. The goal was always the suspension of disbelief for the public as well as ourselves. I used a special tea called Lapsang souchong — the first black tea in history. And I did more than pour. 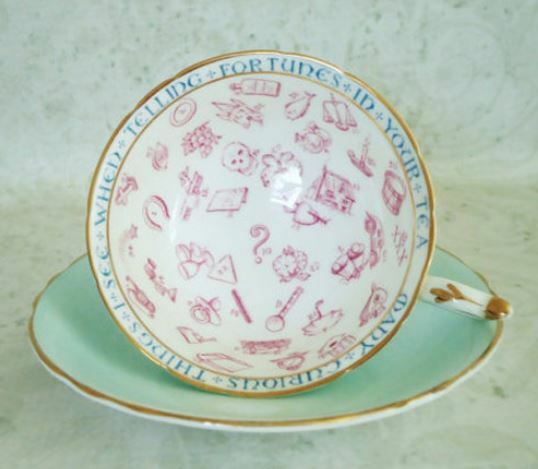 I read the tea leaves between refills–divining our fortunes in the bottom of our china cups. For the next few days my symbol series will cover symbols for divination and luck charms. Mention tea leaves and the first thought that often comes to mind is the Gypsy fortuneteller of old. Scrutinizing sediment in the bottom of drinking vessels is actually an ancient practice that occurred all over the world. This wasn’t done by tea leaves alone. People hunted for patterns in coffee grounds and wine sediments left in their cups too. Why? For the same reason people read horoscopes. I suppose man always wants to know what’s around the bend. The only things I have left from our living history days are my silver spoons and the old book I learned from. I still read leaves for fun, and to set the mood, use my small collection of vintage bone china teacups specially made for that purpose. Tea leaf reading is known as tasseography. When the last small sip is left in the teacup, the leaves clump up and form patterns. The patterns have meanings. Example: if the pattern looks like a chicken, expect a chatty visitor. If you’d like to give tasseography a try you don’t need Lapsang souchong tea. Some tea readers just open regular old black tea teabags and brew their tea as usual. Here are two nice sites with pattern info. Before I begin today’s installment of my 2016 Symbol Series, I’d like to share some fantastic news. Madeline Archer, my alter ego won the coveted Predators & Editors Top 10 Reader’s Poll for Best Author of 2015! Not only that, Entice Me and Exquisite Christmas (the multi-author anthologies I assembled and saw to print) won two spots in the Top 10 Best Anthologies. I’m tickled pink and very proud. Now I’d like to share an old shame. Back in my high school days I contacted an organization that got books on tape into the hands of the visually impaired. I wanted a specific book, but formats like this weren’t available in bookstores. This was the age of the 8-Track so I figured that’s what I’d get. I had no idea books on tape were really books on reels. It turned out they didn’t have my particular book on a reel, not that I could even play a reel if they had. Assuming I was visually impaired, they offered me braille instead. They also said as the book was a short one, they could also have someone schedule to read to me over the phone. Read to me? To be honest, there was a split second where I considered it, but someone in real need would go without. Feeling sheepish and ashamed of myself, I thanked them for their generous offer and declined. What book could possibly lead me down the dark path of chicanery? The Great Gatsby. At the time that book was a necessary evil. A thorn in my side. A pebble in my shoe. It was required reading in my English class and I hated it. From the very beginning that story grated on me. I’d find myself reading and rereading the same miserable paragraphs over and over. My brain just couldn’t get into the crazy writing. I mean really, a city divided into East Egg and West Egg? City = Eggs? Who writes like that?? I had no form of reference and a very young and new English teacher who might have explained the concepts better. Let’s just say I wanted to punch ol’ F. Scot Fitzgerald in the nose. There’s no doubt symbolism in literature creatively enhances the storytelling. But using it like F. Scott Fitzgerald is akin to someone delivering the punchline to a joke and expecting you to instinctively know what the set-up was. After seeing a movie made of the darn book many years later, I came to understand the author’s most dumbfounding metaphoric lines were symbols for concepts. 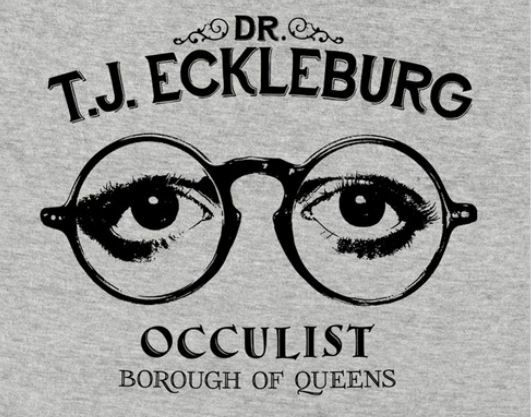 Example: Doctor T. J. Eckleburg’s eyes looking down on the world. Those fading, bespectacled eyes were a metaphor for divine judgement in George’s mind. ::sigh:: Out of all of it, the metaphor that made the most sense was how the weather tied in to everything Daisy Buchanan did or felt. That much was easy. This week’s portion of the 2016 Symbol Series starts with a hodgepodge of things deliberately used to stand in for a thought. But first, how about that record-breaking weather in the Mid-Atlantic? In the Great Gatsby, Daisey Buchanan forever had a cloud or sunbeam on her frame of mind. Weather symbolized the overall mood. Authors will often use weather and natural phenomenon to convey all sorts of details. I’ve done so more than once. Have you? Air ~ German Philosopher Nietzsche thought of air as man’s freedom. His writings often refer to air in one form or another (lots of flying through air in Nietzsche’s mind). Shakespeare too used air as a symbol of thought. As breathing creatures, we rely upon air. Now with breathing and thought in mind, how powerful a metaphor is it to have “air” taken away? Wind ~ Gentle breezes and ill winds generally act as portents signifying that change is on the way. Wind is fleeting and transient. The wind reference often comes in the form of billowing sails that may represent adversity unless a new course is charted. Then it takes on a role of potentiality. If you really want to see wind used to convey a thought, read John Steinbeck’s The Grapes of Wrath. Another fact of me — I was raised in market research. My family business introduced companies to the benefit of both. In order to do that we needed to know what those companies needed, and that required research. I was deep in research at a young age and I still love it. Research equates to treasure hunting for me. Combine reading the encyclopedia with penchant for research and what do you get? You get a very busy mind with one fertile imagination. Fact-wise, when I write, the only thing I take liberty with is how I stitch those facts together. I enjoy when authors take the time to write a believable story, even if that story is about a werewolf. One way to craft a believable story is to include those things people understand intrinsically. Like body language. Today’s post wraps up those telltale body symbols we do on purpose or display subconsciously. I’m sure if you were to think about it, you’d come up with even more. My personal well is dry! As part of my 2016 symbol series, I’m continuing on with yesterday’s body language post. (scroll down for the previous posts to learn more). As mentioned yesterday, we give physical clues to what we’re feeling. Not only do we do this all the time, we do it consciously and unconsciously. Our body language is filled with these symbols and most are universal. The more wide-spread it is, the older it is. One of the oldest is the head nod we interpret as yes and the head shake we interpret as no. That’s just the tip of the iceberg. I’d planned to take it all the way to the toes, but every time I assumed I was done, I though of another! We humans sure say a lot when we keep our mouths shut. Writers often color their stories with these little actions. I certainly do. 🙂 I love Sherlock in all his iterations. Our lives are filled with symbols. Literally filled. Take the simple nod and the shaking of the head. Early on we recognize these gestures as meaning yes and no. Sociologists (who study human social behavior) call these simple body gestures symbols of communication. The interesting thing about those two ancient symbols for yes and no is they’re nearly world-wide in understanding. That shows you how truly old they really are. Of course I understand them as a human. Even toddlers know the gestures for yes and no. Beyond my basic human comprehension, it’s the writer in me that sees potential in the fact non-verbal cues happen consciously and subconsciously. Just knowing that puts my mind in Sherlock mode. 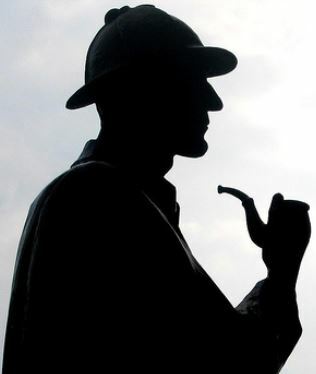 As Sherlock Holmes would say, “Give me details!” The literary world is full of body language — from pacing and nervous twitches to head-scratching perplexity and come hither glances. I could go on. So I will! I started this post with the idea of doing a head to toe run-down of gesture symbology. But after composing all of the following, I saw dozens more in my mind. I’ve decided to list just those head to collar cues today. I’ll post more in the days to come. Sherlock would deduce broader information in the following body language. What do you see? Hair tossing – look at me! Eye batting – you want me don’t you? Holy cow. And that just involves the head! There are so many ways to silently communicate, I’m sure I’ve missed some. Other nonverbal gestures involving hands and body stances say even more. That these symbols of nonverbal communication have universal understanding proves just how ancient they are. Perhaps they trace back to a time when the earliest humans didn’t use words. I say universal because this communication is recognized all over the world. That said, there are places in the world where cultures just do them a little differently. For example: your A-Ok or thumbs-up hand gesture would be taken as an insult akin to flashing your middle finger. Oddly, there are also cultures where your nod means no. In Korea, you must be careful how you smile. As ancient as they are, I wonder how these non-verbal communication anomalies came to be.